In the early 1930s, Josef Stalin became the sole leader of Soviet Russia and was able to focus on the industrial development of the country that he had been fighting so vigorously for with his rivals. His political and economic reforms through the Five-Year Plans were to turn Russia into a leading world power. This was the realization of a provocative dream, considering the drama with the ruined economy, shortages, disruption of supplies and the brain drain caused by the October Revolution of 1917 and the Civil War that ensued. One of the urgent goals the Bolshevik Party set itself was to make people work very hard for the sake of the bright future. Stalin’s life experience and unfinished education at a theological seminary in Georgia had helped him recognize that art, music and architecture could inspire people to sacrifice themselves on the labor and agricultural battlefields. The role that monumental propaganda in different cultures had played in fostering such sacrifice was well known; whether it was a temple in Ancient Egypt or a Jesuit monastery. Stalin was a brilliant choreographer of mass ceremonies but he badly needed ceremonial locations, broad squares, straight avenues and lavishly decorated palaces. The constructivism of the 1920s, architecturally austere, almost complete devoid of any decor, could hardly support examples of dedicated labor or glorious pictures of Soviet prosperity. Moscow was to become the supreme world capital, the sacred city of communist ideology, the lifetime monument to Josef Stalin, the farther and the sun of the nation. With this mission fixed in their minds, the government centralized and structured all independent creative societies and individuals into unions of musicians, artists or architects. Prior to that, already in 1931, the last open competition for the project of the Palace of the Soviets on the site of the Christ the Savior Cathedral, where both Soviet and international architects worked was held. During the competition, directions to follow classical style with its symmetry, columns, porticos and decorations; to show the grandeur of soviet power had trickled down to competitor-architects. Never actually completed, the Palace of the Soviets, topped with a statue of Vladimir Lenin, became an architectural ghost on the Moscow skyline, influencing many of the buildings of 1930s-1950s. Classical style, originating from Ancient Greece but based on much older traditions, has appeared more than once in the course of history under different names of: classicism, neo-classicism, revival or pseudo-classicism due to certain economic and political conditions. In short, it has appeared in conditions of stability or when stability is desired. Stalin wanted to link his empire with the respectable past of Russia with its rich culture and history, and plaster the wounds of the Revolution. The Classical style was ideal for that. Russian classical churches and estates nearby served as brilliant inspiration. Adorned with pompous baroque features, classicism had convincing potential to tell stories in brick and stucco, giving advice, promise and warning. From the early 1930s, strong recommendations to use a fusion of artistic methods so that architectural ensembles should include sculptures, murals, mosaics, stain glass, and putting a strong emphasis on Egyptian art, were written about in the Soviet press. Aware of the new trends, Alexei Shusev, one of the most recognized church architects before the 1917 revolution, created Lenin’s Mausoleum in Red Square in the style of an Egyptian tomb with the immortal pharaoh-god in a glass sarcophagus. Red Square soon became hallowed ground where atheistic ceremonies were enacted. Very soon the presence of a pantheon of new soviet gods of labor, maternity, agriculture or sports in brass and stone would be felt in palaces, metro stations, parks and squares. No other epoch could boast of the use of so many symbolic decorative elements borrowed from different cultures, religions and historical periods. Ancient symbols were used out of context and have been perceived as Soviet emblems since then. The 1935 Master Plan of Moscow Development initiated monumental changes to the city. With total property ownership, means and funds concentrated in the hands of the state; which was both the sole client and executer, and with cheap, almost slave-labor, the government was able to rebuild the city in a record time. The main streets, including current Tverskaya and Prospect Mira were broadened, houses were either demolished or moved away. A new ring of squares around the Kremlin was created, the Moskva and Yauza rivers were decked in granite embankments and crossed 11 bridges. In 1937, Moscow was connected with the Volga River by a canal, with ports, locks and embankments all lavishly decorated with sculptures of Lenin and Stalin. The first Metro line was opened in May 1935; and before Stalin’s death in 1953, 40 underground palaces [stations] were created along the 50 kilometer- long line. The new city design was comprehensive, and included construction of new factories, schools and universities, hospitals, department stores, offices, apartment buildings and parks. One can find evidence for this all over the city now. Decding whether to praise or criticize the work is complex. A lot of beautiful churches and monasteries, as well as romantic wooden houses disappeared, but a new capital was erected – we should not forget that when in 1918 the Soviet government changed its seat from St. Petersburg to Moscow, it had not been the capital city for 200 years. In 1939 All-Union Exhibition of Agriculture, now VVTs was opened as a huge outdoor propaganda venue. A true paradise on Earth with palaces of dairy products, gardens and orchards, stables, monuments to horses and portraits of the heroes of agricultural labor. The most famous Soviet sculpture of the Worker and the Kolkhoz Woman created by Vera Mukhina for the International Exhibition in Paris of 1938 made a journey back home and was mounted there. They wrote songs and made movies about it, guides told convincing stories of the wellbeing of Soviet collective farmers. 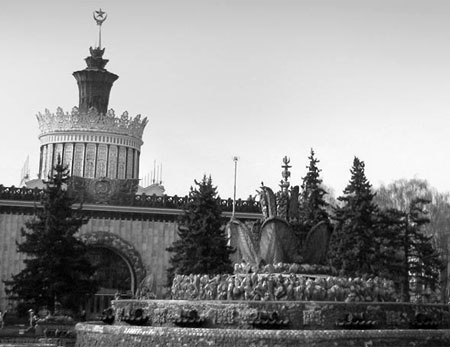 After WWII, the place was renamed as the All-Russian Exhibition of Economic Achievements and became even more triumphant with new palaces for all fifteen Soviet Republics, industry pavilions, recreational parks, lakes, fountains and statues of leaders. 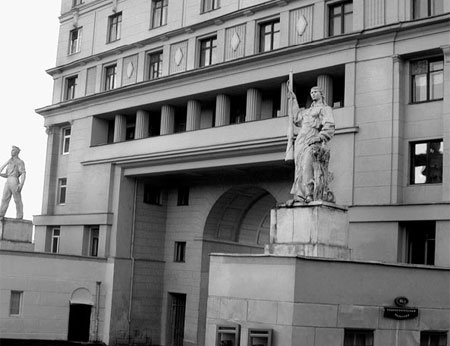 One can define two periods of Stalinist architecture: before WWII, when it was an eclectic mixture of classicism and baroque, enriched with Russian national traditions and an equally eclectic empirical style after the War. World War II of 1941-1945 being a cultural phenomenon contributed a lot into to Soviet music, literature, art and architecture. It is amazing that regardless of all the hardships endured, construction never stopped in Moscow, it just slowed down. Already in 1943, the Council for the Reconstruction of Destroyed Cities was established. Soviet architects created a Napoleonic anthem to victory. The shapes of the buildings became more elaborate, balconies and cornices heavier, arches bigger. More weapons, including contemporary armaments and ancient helmets and spikes, as well as banners, drums, horns were used to show the glory of the army, which ensured the victory. The seven towers or high-rise palaces, which appeared on the Moscow landscape between 1947 and 1953, presented the peak and the farewell of the Stalinist era. They have become definitive landmarks, reminiscent of both Kremlin towers and Russian temples at the same time. Towering into the skies they were palaces where the Soviet elite worked, studied and lived: two apartment buildings, two hotels, two office buildings and the Moscow State University. Designed by seven groups of architects they followed the same style but have their unique characteristics, elaborately decorated with sculptures, ceramics, mosaics and natural stone. Being very controversial, Stalinist architecture is not easy to understand: some people consider it very heavy and imposing, others could see the work of very talented architects. Best to view it in full light as it was created for a dream, some kind of a fairy tale, where the sky is always blue and the sun is bright.